Christensen shared his troubled past with a large group of guests and the media during a news conference on Oct. 19, 2015. 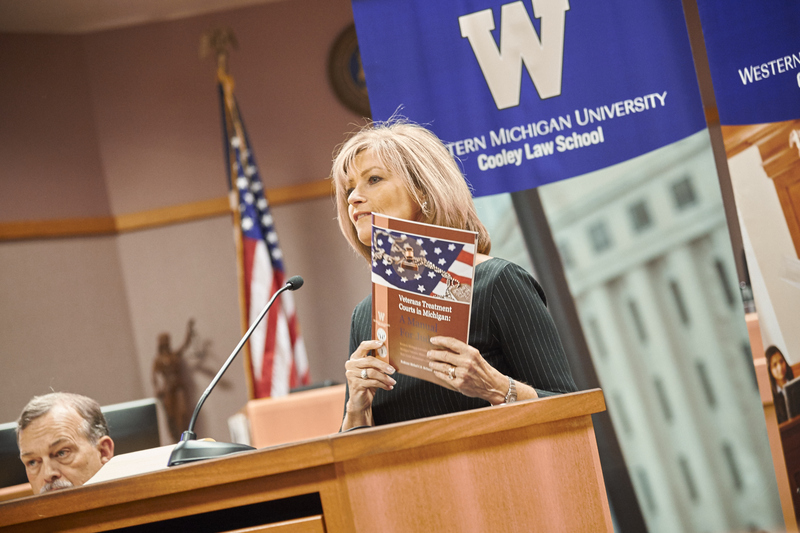 The event announced a new Veterans Treatment Courts Manual for judges and featured a panel of speakers from WMU-Cooley Law School, Michigan Veterans Affairs Agency, and the State Court Administrative Office. The manual will be a valuable resource for Michigan trial court judges and staff interested in developing veterans treatment courts. During the conference, Christensen made it clear that his turning point was when he became involved in the veterans treatment court. “They made me feel they cared. They wanted to help me. They didn’t want to punish me.” Today, Christensen, as a graduate of the court, is doing everything he can do to make sure others don’t go through what he did. Veterans Treatment Courts in Michigan: A Manual for Judges is a compilation of best practices being used to address the special circumstances of veterans confronted with non-violent criminal charges and is designed to serve as a blueprint for the further development of problem-solving courts for veterans. 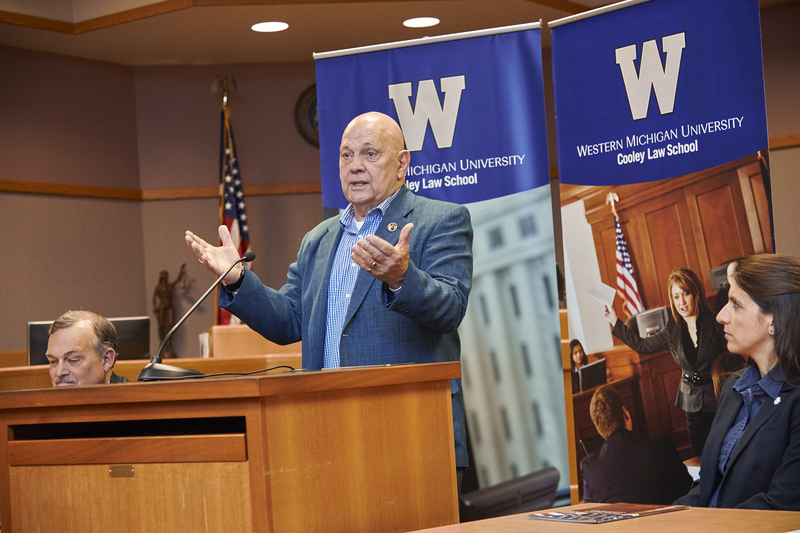 The Veterans Treatment Court manual, which was was compiled through interviews conducted by WMU-Cooley students and edited by MVAA and Brigadier General and WMU-Cooley Professor Michael C. H. McDaniel, will serve as a tool for district and circuit court judges who do not operate a veterans treatment court,but wish to develop one in their jurisdiction. 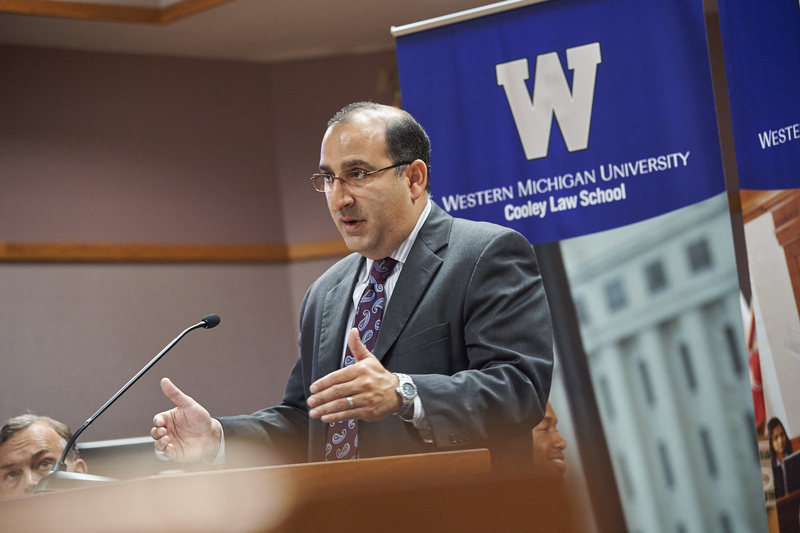 It includes suggested best practices and advice from Michigan judges who currently operate a VTC and was compiled through interviews conducted by WMU-Cooley students and edited by Michigan Veterans Affairs Agency and Ret. Brigadier General and WMU-Cooley Professor Michael C. H. McDaniel. Ret. 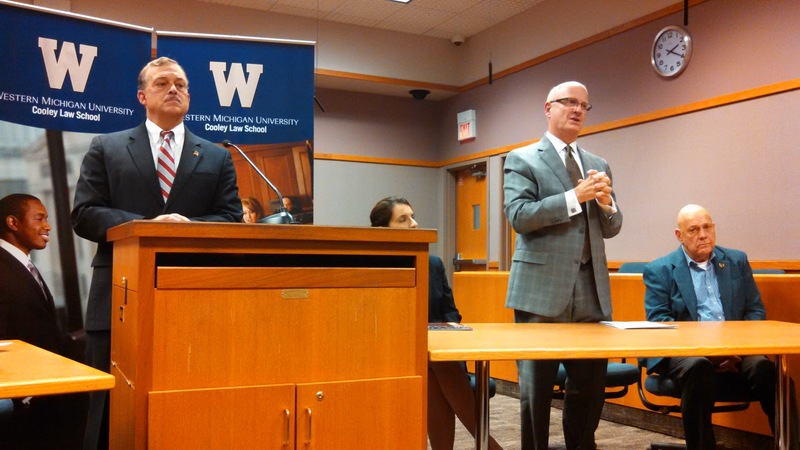 Brigadier General and WMU-Cooley Professor Michael C. H. McDaniel (far left) fields questions from the media and guests at East Lansing, Michigan’s 54-B District Court during an Oct. 19 news conference. Seated from left, Kristina Leonardi, Michigan Veterans Affairs Agency director of strategy, Judge Richard Ball standing, and Gunny Christensen. Veterans Manual news conference speakers included, along with Ret. Brigadier General and WMU-Cooley Professor Michael C. H. McDaniel, 54-B District Court Chief Judge Andrea Andrews Larkin, Michigan Supreme Court Justice David Viviano, Michigan Veterans Affairs Agency Director of Strategy Kristina Leonardi, 54-B District Court Judge Richard Ball, and Veterans Treatment Court graduate Earl “Gunny” Christensen. More information about the Veterans Treatment Court manual and VTCs is available at courts.mi.gov/vetcourts. The “Veterans Treatment Courts in Michigan: A Manual for Judges”can be accessed at www.courts.mi.gov/vtcmanual.